Carbon-14 is a weakly radioactive isotope of Carbon; also known as radiocarbon, it is an isotopic chronometer. C-14 dating is only applicable to organic and some inorganic materials (not applicable to metals). Gas proportional counting, liquid scintillation counting and accelerator mass spectrometry are the three principal radiocarbon dating methods. Radiocarbon dating is a method that provides objective age estimates for carbon-based materials that originated from living organisms. 1 An age could be estimated by measuring the amount of carbon-14 present in the sample and comparing this against an internationally used reference standard. The impact of the radiocarbon dating technique on modern man has made it one of the most significant discoveries of the 20th century. No other scientific method has managed to revolutionize man’s understanding not only of his present but also of events that already happened thousands of years ago. Archaeology and other human sciences use radiocarbon dating to prove or disprove theories. Over the years, carbon 14 dating has also found applications in geology, hydrology, geophysics, atmospheric science, oceanography, paleoclimatology and even biomedicine. Radiocarbon, or carbon 14, is an isotope of the element carbon that is unstable and weakly radioactive. The stable isotopes are carbon 12 and carbon 13. Carbon 14 is continually being formed in the upper atmosphere by the effect of cosmic ray neutrons on nitrogen 14 atoms. It is rapidly oxidized in air to form carbon dioxide and enters the global carbon cycle. Plants and animals assimilate carbon 14 from carbon dioxide throughout their lifetimes. When they die, they stop exchanging carbon with the biosphere and their carbon 14 content then starts to decrease at a rate determined by the law of radioactive decay. Radiocarbon dating is essentially a method designed to measure residual radioactivity. By knowing how much carbon 14 is left in a sample, the age of the organism when it died can be known. It must be noted though that radiocarbon dating results indicate when the organism was alive but not when a material from that organism was used. Gas proportional counting is a conventional radiometric dating technique that counts the beta particles emitted by a given sample. Beta particles are products of radiocarbon decay. In this method, the carbon sample is first converted to carbon dioxide gas before measurement in gas proportional counters takes place. Liquid scintillation counting is another radiocarbon dating technique that was popular in the 1960s. In this method, the sample is in liquid form and a scintillator is added. This scintillator produces a flash of light when it interacts with a beta particle. A vial with a sample is passed between two photomultipliers, and only when both devices register the flash of light that a count is made. 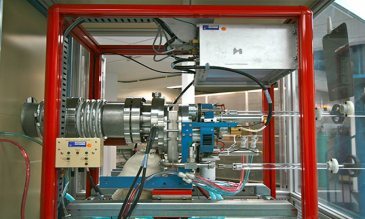 Accelerator mass spectrometry (AMS) is a modern radiocarbon dating method that is considered to be the more efficient way to measure radiocarbon content of a sample. In this method, the carbon 14 content is directly measured relative to the carbon 12 and carbon 13 present. The method does not count beta particles but the number of carbon atoms present in the sample and the proportion of the isotopes. Not all materials can be radiocarbon dated. Most, if not all, organic compounds can be dated. Some inorganic matter, like a shell’s aragonite component, can also be dated as long as the mineral’s formation involved assimilation of carbon 14 in equilibrium with the atmosphere. Samples that have been radiocarbon dated since the inception of the method include charcoal, wood, twigs, seeds, bones, shells, leather, peat, lake mud, soil, hair, pottery, pollen, wall paintings, corals, blood residues, fabrics, paper or parchment, resins, and water, among others. The radiocarbon age of a certain sample of unknown age can be determined by measuring its carbon 14 content and comparing the result to the carbon 14 activity in modern and background samples. The principal modern standard used by radiocarbon dating labs was the Oxalic Acid I obtained from the National Institute of Standards and Technology in Maryland. This oxalic acid came from sugar beets in 1955. Around 95% of the radiocarbon activity of Oxalic Acid I is equal to the measured radiocarbon activity of the absolute radiocarbon standard—a wood in 1890 unaffected by fossil fuel effects. When the stocks of Oxalic Acid I were almost fully consumed, another standard was made from a crop of 1977 French beet molasses. The new standard, Oxalic Acid II, was proven to have only a slight difference with Oxalic Acid I in terms of radiocarbon content. Over the years, other secondary radiocarbon standards have been made. Radiocarbon activity of materials in the background is also determined to remove its contribution from results obtained during a sample analysis. Background radiocarbon activity is measured, and the values obtained are deducted from the sample’s radiocarbon dating results. Background samples analyzed are usually geological in origin of infinite age such as coal, lignite, and limestone. A radiocarbon measurement is termed a conventional radiocarbon age (CRA). The CRA conventions include (a) usage of the Libby half-life, (b) usage of Oxalic Acid I or II or any appropriate secondary standard as the modern radiocarbon standard, (c) correction for sample isotopic fractionation to a normalized or base value of -25.0 per mille relative to the ratio of carbon 12/carbon 13 in the carbonate standard VPDB – Cretaceous belemnite formation at Peedee in South Carolina, (d) zero BP (Before Present) is defined as AD 1950, and (e) the assumption that global radiocarbon levels are constant. Standard errors are also reported in a radiocarbon dating result, hence the “±” values. These values have been derived through statistical means. American physical chemist Willard Libby led a team of scientists in the post World War II era to develop a method that measures radiocarbon activity. He is credited to be the first scientist to suggest that the unstable carbon isotope called radiocarbon or carbon 14 might exist in living matter. Mr. Libby and his team of scientists were able to publish a paper summarizing the first detection of radiocarbon in an organic sample. It was also Mr. Libby who first measured radiocarbon’s rate of decay and established 5568 years ± 30 years as the half-life. In 1960, Mr. Libby was awarded the Nobel Prize in Chemistry in recognition of his efforts to develop radiocarbon dating. 1. American Chemical Society National Historic Chemical Landmarks. Discovery of Radiocarbon Dating (accessed October 31, 2017).